Every day, more and more Veritas Backup Exec customers switch to Veeam®. Why? Because Backup Exec does not deliver the 24.7.365 Availability today’s businesses demand with the ability to restore any IT service running in the hybrid cloud within seconds and minutes. Check out the top 7 reasons NOT to renew Veritas Backup Exec and switch to Veeam today! Veeam is a solution that was specifically designed for the modern, highly virtualized hybrid cloud world. It allows you to meet aggressive SLAs for IT service recovery that can be measured in seconds and minutes versus the hours and days often required by Backup Exec. According to the IDC Research, Veeam customers meet their recovery time and point objective (RTPO™) SLAs 91% of the time compared to only 69% with their previous legacy provider. Veeam was built to manage the amount of data found in the modern data center of today — not the ones of yesteryear. Veeam is an innovation leader with a proven history of being first to deliver market-defining capabilities, support of the latest platforms and the most comprehensive and forward-looking cloud vision in the industry. Backup Exec was a good product when it was designed more than 30 years ago but it still lacks some of the key capabilities that Veeam invented, such as Instant VM Recovery® without limitations, SureBackup® and SureReplica, Virtual Labs, 2-in-1: backup and replication™ and many others! 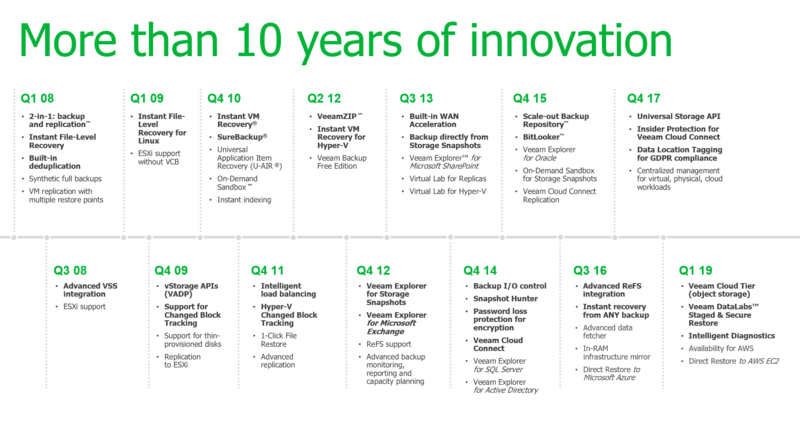 Veeam is one of the fastest growing enterprise software companies today. It is a privately held rocket ship on target to reach $1 billion in yearly sales by 2018 with freedom to innovate. Recognized by IDC and Ovum as a top choice among data protection and Availability solutions, Veeam’s forward momentum is in stark contrast to the lagging innovation, declining revenue and declining market share of Veritas. Veritas is owned by a private equity firm who must return $7.4 billion to lending banks. Its primary goal will likely be to reduce costs and generate cash for lenders. As Veritas imposes layoffs and continues to lose market share, one can only speculate what additional steps will have to be taken to right the ship. Veeam’s growth shows no signs of slowing down — adding more than 4,000 new customers every month and new powerful capabilities with every release. Veeam’s straightforward approach to licensing combined with a near-effortless scalable architecture and deployment gets you up and running in minutes. With no agents to protect virtual workloads or applications, 2 out of 3 Veeam customers spend 35% less time managing their Availability infrastructure which frees them up for more productive tasks. Compared to Backup Exec’s multiple licensing scenarios, myriad agents and separately licensed products, the choice is clear. With industry-leading features such as instant, agentless recovery for tier-1 Microsoft applications, built-in WAN acceleration, secure end-to-end encryption, an innovative Scale-out Backup Repository™, deep integration with leading primary and deduplication storage arrays and advanced replication capabilities that enable near-continuous data Availability, Veeam’s capabilities are unrivaled by Veritas. And unlike Backup Exec, Veeam’s ability to scale to protect thousands of VMs and millions of files ensures Availability no matter your company’s size. “It Just Works” – that is the #1 feedback from Veeam customers. Veeam customers report substantially less downtime and fewer backup and replication failures than with legacy backup solutions. In fact, it’s the #1 reason enterprises select Veeam! Patented automated backup and replica testing AND recovery verification for 100% of your workloads, combined with Veeam’s industry-leading customer support will help you sleep better at night. Backup Exec, on the other hand, has no automated backup testing and recovery verification, no infrastructure monitoring, and according to the Storage magazine/SearchStorage.com Quality Awards, ranks last in reliability and support. Veeam’s customers are overwhelmingly satisfied with our product features and functionality, ease of use, technical support and sales effectiveness. With a Net Promoter Score (NPS) of 2x the industry average, 9 out of 10 Veeam customers WOULD recommend Veeam to their peers. Former Backup Exec users tell us they switched to Veeam for the stable, hybrid cloud-focused, high performance that Backup Exec couldn’t deliver. Hands down, Veeam Backup & Replication is the one solution that actually delivers what is promised. Veeam’s feature set and ease of use make it a clear winner over other options.